This line up should give me some decent pass rushing from the DE and a good mix of Man and Zone coverage in the Linebackers and Secondary. This entry was posted in American Football, Madden, NFL, PS4 and tagged 4-3 Defense, Madden 15, MUT15 on December 5, 2014 by Stephen Hoult. I’ve just started playing Madden Ultimate Team 15 (MUT15) online – I’ve played offline a little. 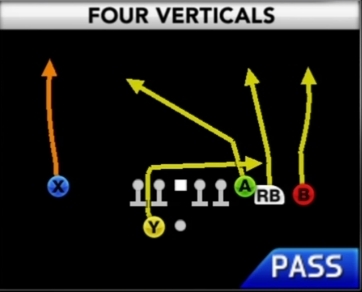 I’m currently 1-2 in my first season and in game 3 I was absolutely tortured by someone running a lot of the ‘Four Verticals’ passing play – it didn’t help that once he knew I was struggling with it he ran a ‘hurry up offense‘ which didn’t give me any time to figure out what to do. Next time I see someone running a lot of ‘Four verticals’ I’ll attempt some of the above points and hope it works! This entry was posted in American Football, Madden, NFL and tagged 4 verticals, Cover 4, Madden 15, MUT 15, PS4, VDoggFTM on December 3, 2014 by Stephen Hoult.